Economic and commercial developments in Arab countries continue to attract attention. Courts in the non-Islamic world increasingly need to decide issues involving Arab laws and Islamic law generally. This interest in Arab countries, not only internally but externally as well, enhances the need for a topical journal on Arab law. The leading English-language legal publication in its field, Arab Law Quarterly covers all aspects of Arab laws, both Shari'a and secular. It provides authoritative articles on the laws and legal developments throughout the twenty countries of the Arab world, notes on recent legislation and case law, guidelines on future changes, and reviews of the latest literature in the field. Specific articles have addressed the judiciary in Saudi Arabia, punishment in Islamic Law, the origins of the sanctity of contracts in Islamic Law, mercy killing in Islam (moral and legal issues), the legal capacity of women in Islamic law, the Federal Penal Code and the aim of unification in the context of the UAE, Kuwait's approach to Law No. 25 of 1996 on government contracts, Lebanon as a case study for 90s tax reform issues, negotiating contracts in Islamic and Middle Eastern Law, and recent developments in the Sultanate of Oman. 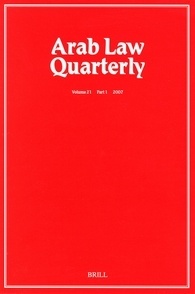 Articles in the Arab Law Quarterly represent the views of their authors, and do not necessarily reflect the views of the members of the Editorial Board.